Dedicated to the design and engineering of premium performance parts for racers, Advanced Engine Management (AEM) continuously strives to deliver the best racing electronics solutions. 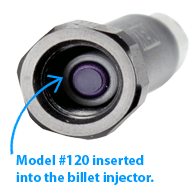 In 2007, they introduced their Water/Methanol Injection Kits to the marketplace, and more recently teamed up with our own Smart Products engineering team to update this system with our Model #120 check valve. The latest version of the Water/Methanol Injection Kits integrates a Smart Products' check valve inside the aluminum billet injector. The valve ensures fluid only flows when the system is engaged via the signals in the electronic controller. The valve's function also prevents any liquids left in the fluid line from entering into the inlet when the system is not in operation. "The valves have been a valuable addition to our water methanol injection systems because they allowed us to integrate this feature directly into our injector instead of having to run a separate check valve along the fluid line, which can create a potential for leakage because of the additional splicing necessary to install an external check valve," says Lawson Mollica, Marketing & PR Director with AEM Performance Electronics. Mollica also adds, "They provide a cost savings to the end user because they do not need to purchase an electronic solenoid to activate the flow of fluid when the system engages. Although we offer the option for this feature if the customer insists on having it, but it really isn't necessary given the integration of the check valve. The valves have proven extremely reliable as we never hear of an issue concerning fluid leaking into the inlet with our systems." 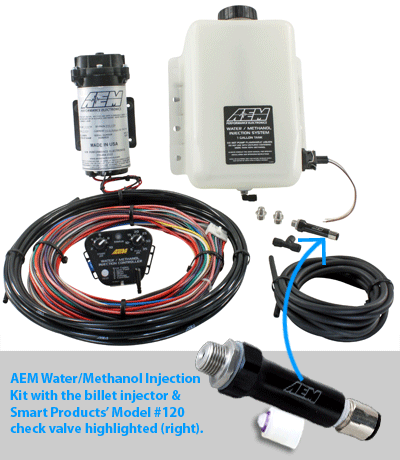 To learn more about AEM's Water/Methanol Injection Kits, click here. When space, size, and weight are critical to a specific design criteria, our Standard Cartridge Model #120 Check Valve is a great flow control solution with an O.D. size at 5/16" (7.94mm). Additionally, this model, like all of our valves, can be customized by plastic body material, o-ring, and opening PSI. Model #120 is available in Polypropylene, Nylon, Acrylic, Acetal, PVDF, Polycarbonate, Ultem®, and ABS plastics. O-ring options include Buna-N, EPDM, Viton®, Silicone, and Fluorosilicone. Available opening spring pressures range from 0.09 to 20 PSI.